Participants : J. Dumon [contact person] , P. Bellemain [GIPSA-Lab] , S. Nicolas [PROLEXIA] , N. Maciol [PROLEXIA] , F. Martinez [ROBOSOFT] , J. Caquas [ROBOSOFT] . MASim is a tool that has been adapted from our former multiagent simulator MUSim (MUSim=MASim + ConnectSim + ConnectIHM). It integrates agent’s models, communication media including their limitations, heterogeneous network, and all the variants of the multi-agent control strategies. Besides the models and simulation engine, the simulation can be replayed through a GUI, an interactive graphical interface which is used to visualise and interpret the state of the multi-agent control system and communication topology. The validation scenario is a real-size application enough complex to enforce the pertinence of our results. 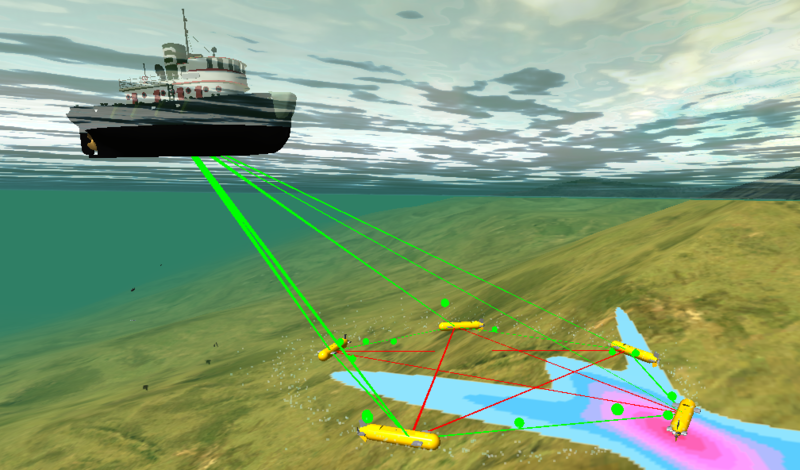 The simulator MASim is now being used as an open research tool for various applications in the field of multi-agents networked systems, particularly within the FeedNetBack project (see Fig. 4 ). Figure 4. A scenario's view obtained with MASim .